For the fans that need everything on the go, check it out (Ubuntu 8, not yet 9.10). What is Portable Ubuntu Remix? Portable Ubuntu Remix is an Ubuntu system running as a Windows application. This system is built with the Colinux Kernel, Xming X server and Pulseaudio server for Windows. Who is the target public? People that want to try Ubuntu using a simple way. People that need use Linux applications on Windows. People that want to use Linux, but they can't install it in they job, or some other place. People that want bring Ubuntu with them to anywhere. Whether you run Windows or Linux, whether you want to make an existing distro USB bootable or some of the nice little tools and system utilities, UNetbootin is the tool you want ! 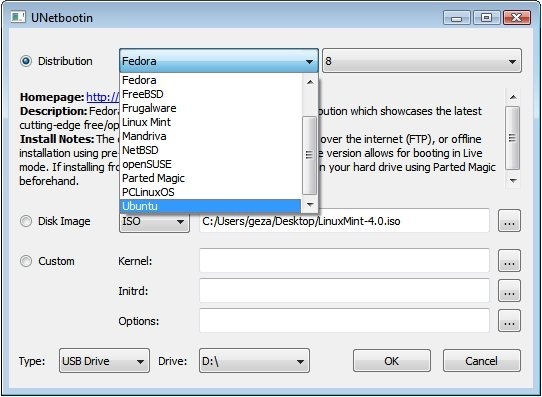 UNetbootin allows you to create bootable Live USB drives for a variety of Linux distributions from Windows or Linux, without requiring you to burn a CD. You can either let it download one of the many distributions supported out-of-the-box for you, or supply your own Linux .iso file if you've already downloaded one or your preferred distribution isn't on the list.